The Dreaded 404 Page Load Error - Use It! We've all seen it, more than web publishers would like. That dreaded 404 Page not found error. A couple months ago, someone wrote to me regarding my company site saying they got an external link back to my site and received a 404 error because the linker mistakenly referenced the URL. It happens. Then one day I stumbled on Smashing Magazine's article that showed creative 404 pages. I hadn't even known that using the 404 error to go to a specific page was possible. But now that I did, I was determined to use it to my advantage, and I recommend you do the same with your site. 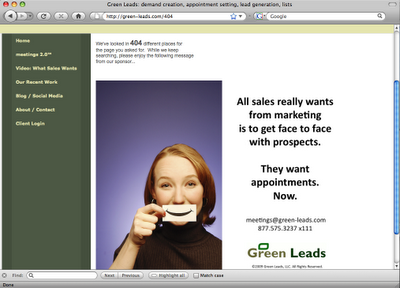 We created a simple 4 panel video with some Green Leads messaging about appointment setting. It's sweet, short, and conveys what we want to convey in 15 seconds. Now that's a good use of someone's typo mistake. To see it work, you can type any url address at www.green-leads.com that may not exist, like http://www.green-leads.com/missingpage.html or yourname.html, whatever. The missing page will redirect your browser to our video. Try it. Type in anything you want after the ".com/" and it will work. You can learn how to create your own custom 404 page here. Green Leads' Founder, CEO and CMO, Mike Damphousse, writes frequently about b2b marketing, demand generation, appointment setting, lead gen, and marketing in general. © 2015 Green Leads Holdings, LLC 2006-2012 All Rights Reserved. Green Leads® is a Registered Trademark.